Virtual reality (VR) is one of the more recent examples of multimedia. It was initially merely a theoretical concept, confined to works of science fiction. However, thanks to technological innovations it has finally become a reality. It uses multi-sensory data and 3D graphics to present information to the user in real time. People are able to interact with VR programmes. Headsets are used to show the visual information in a way that is designed to immerse them completely. They can be used to map out a real-life environment. Users can then experience what it is like to walk around these areas. Museums are already using VR for this exact purpose. They can also be used in the simulation of real events, such as flying. This makes it an ideal medium for those training for the emergency services and the air flight industry. It allows people to experience dangerous situations without facing the harmful consequences if they make a mistake. 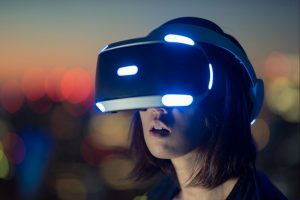 However, the most lucrative use of VR is in the video game industry. It allows players to experience fictional universes in a way that is much more immersive than simply staring at a screen. Players can see through the eyes of the characters in the game’s story. VR gaming is also currently being used as a form of therapy in the UK. It has been proven to help patients deal with a number of conditions and disorders. There are several types of criteria that can be used to measure the effectiveness of a multimedia platform. Virtual reality matches much of this criteria. It is easy to use for beginners. The headsets and sensor monitors used have proven to be very intuitive and accessible. These products are also suitable for a multitude of people, regardless of their IT skills level. They are designed not to require extensive technical knowledge. The more complex VR systems come with easy to read instructions. The content is also very engaging. There is no other form of multimedia that engrosses the user in the same way that virtual reality does. It undoubtedly gives the illusion of being in a completely different world. The player is not just a passenger watching the action. They are able to move around and engage with the environment as if they are actually there. These factors make this medium one of the best modern ways to experience video games and other similar types of software.